One of the most common questions we get is about the quality of the water in Banklick Creek. While we don't collect water quality data ourselves, we have provided the links below for more information. 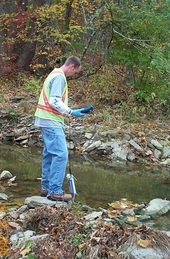 The Kentucky Watershed Watch volunteers collect water quality data across the state. Results are available at the data portal. Access EPA's assessment reports for the Banklick Creek. SD1 performed detailed characterization of NKY's watersheds and potential sources.